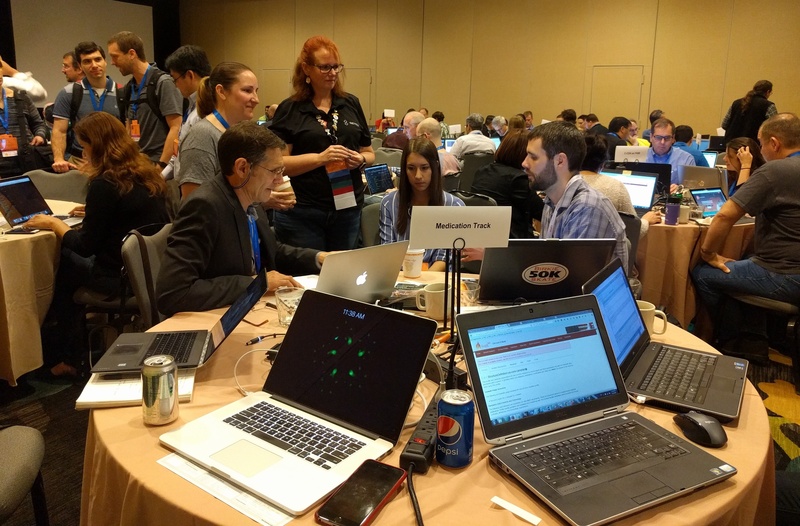 At the HL7 FHIR Connectathon 14, held January 14 - 15, 2017 in San Antonio, I participated in the medication track. See my previous post to learn more about how I ended up in the medication track. It was already 9:23 am. One could argue that on a normal Saturday morning, that's an early start time. I later learned the total number of participants at the HL7 FHIR Connectathon 14 was 200+ (a sharp increase from the 6 who attended the first Connectathon just a few years ago). It seemed like 20+ round tables, packed close to each other, each with 6 to 10 participants, elbow to elbow. Some attendees engaged in lively discussion, some furiously wrote code, and some just stared at their screens (most displaying a FHIR resource page) brows creased in concentration. Why couldn’t I drag my behind out of bed a little earlier for the opening remarks so I could orient myself better? Which table should I start from? In this mild confusion, I walked past each table to see if I could find anyone I knew or a track I was familiar with.